The existing Assistance Dogs UK system excludes many disabled people from the benefits of being partnered with a Recognised Assistance Dog. Waiting lists are years long, and very few of the approved charities train-up a dog that the disabled person already has. Many applicants do not have the room to obtain a second, Recognised dog. Some groups of disabled people are excluded from applying for dogs altogether, such as those with mental health conditions and adults with Autism. Nobody offers owner-training for people who need hearing or guide dogs. New organisations wanting to offer some of these services have been unable to join ADUK as they must be running for seven years first, all without having legally protected access to public places with their disabled partnerships. We are not against Assistance Dogs UK (one of IADA’s co-founders is waiting for an Assistance Dog from an ADUK charity!) but are merely offering another, desperately-needed choice for disabled people alongside them. We are proposing a change to the law that allows all organisations training Assistance Dogs – providing they adhere to the standards described by Assistance Dogs International – to train partnerships that can access public places. 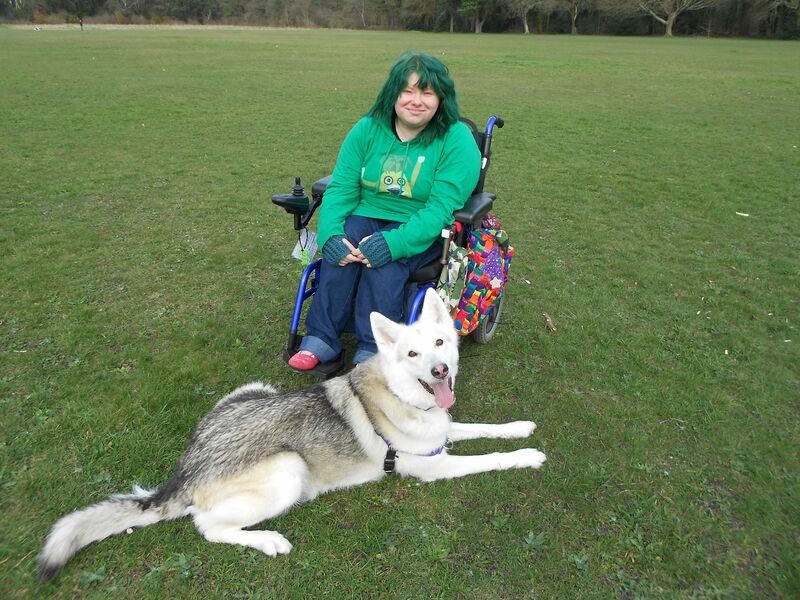 It started with Freya, a two year-old rescued Northern Inuit dog. My disability was degenerating rapidly and I did not have time to sit on a charity waiting list for two years. Freya changed my life. She picked up the things I dropped, lifted clothes out of the washing machine, pushed and pulled doors, turned on lights and helped to pull my clothes off, all things that my disability, Ehlers-Danlos Syndrome, would have given me dislocated joints, burst blood vessels, or ripped skin for trying by myself. Despite having my life radically altered by Freya, I still could not be fully independent with her. I got in touch with the three charities which would accept a disabled person’s existing dog. While waiting for two of them to have space, Freya reached the age of four, their maximum age cut-off for training. The third charity would not take her because of her breed. This all meant that I had to apply for a Recognised Assistance Dog in order to get out and about independently. With Freya able to take care of me inside the home, I was at least able to wait for the required number of years. Even though obtaining a Recognised dog was no longer an issue for me personally, I knew there were plenty of other disabled people out there like me, unable to have their own dog trained for the outside world, but also unable to accommodate a second dog. Through writing to my MP about the issue and being referred to Spectrum CIL, I met with Lise Marron and her home-trained dog Dáithí. Lise also wanted a way for disabled people to be able to independently-train their dogs without needing a space with one of the charities. Lise founded Capable Creatures with a focus on mental health assistance, while I developed IADA to help people train many categories of dog. I am the Chair of Trustees, the applicant assessor and the partnership manager. I receive applications, meet people and their dogs, start preliminary training, and will manage qualified partnerships and make partnership visits.